July 2014 Update with final thoughts. For more visit Part 2, and sort of Part 3. To the left is my bottom line answer to that question. It's something I've given a lot of thought to over the years but never really found a concrete enough solution to move the answer to "yes". Before everything that drove the political climate toward stricter gun control, which then drove a wave of fear buying through the firearm community - in my opinion - ammunition was already far too expensive. I don't want to turn this into an opinion piece on the "ammunition shortage" or anything like that, but let me just say I personally have no driving reason to let whoever it is in the supply chain screw me the way gasoline/oil companies have the rest of the nation. I want to be supportive and I want to be prepared, but at the end of the day it boils down to money, regardless of how you or anyone else feels about the Second Amendment. Bottom line; extra coin is going into someone's pocket whether it is the manufacturer, distributor, wholesaler, or retailer, while the cost of production hasn't changed. Cut it however you like, that seems wrong to me and all while riding on the deaths of children and the election (re) of an unpopular president. All that aside, airsoft replicas and .22 kits for, or variants of, popular handguns and rifles have recently grown in popularity and legitimacy in both training and recreational shooting. The expense of ammunition was already unreasonable and getting trigger time with something was better than none or less than before. Factor in this new ammunition situation and well, I personally haven't fired or purchased a single round in 2013. So I revisited the airgun market once again. There seems to be a mental divide when it comes to airguns. Those who resist them divide firearms from airguns and are seemingly unwilling to accept that shooting is simply fun. And in my mind, fun regardless of what you're shooting. Getting hits is getting hits and the only factor airguns cannot readily replicate is recoil. Second to that is range. 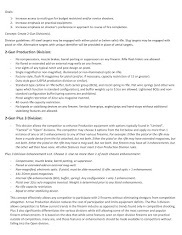 Range when talking about pistols, isn't a significant factor in my mind given realistic defensive engagement distances and gaming range limitations like those found in IDPA. Range can be further overcome with the use of small targets. Third is malfunctions. So the first question should be; is the concept even realistic? 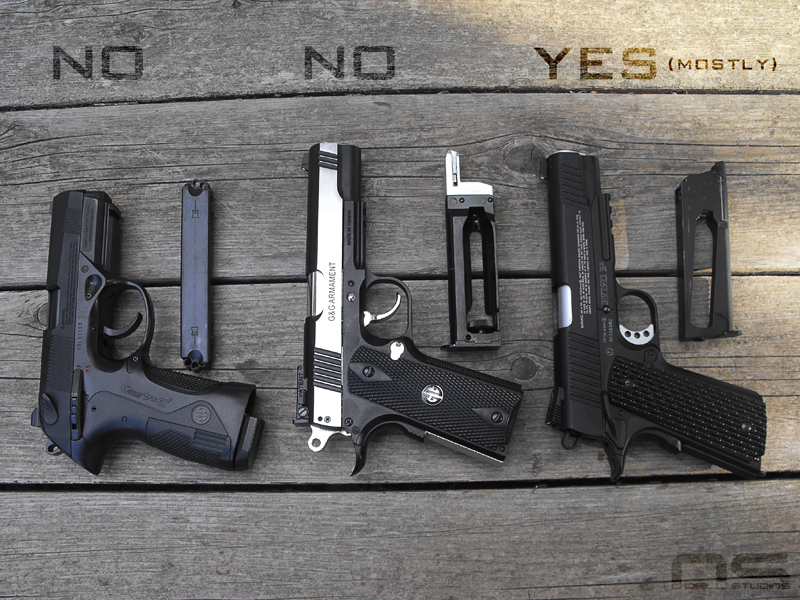 If we're strictly speaking handguns, then yes I believe so. To outline concept, airguns easily fit the recreational aspect and allow the general enthusiast a chance to practice the fundamentals of shooting - and they've done so for decades. I also believe that they could apply to shooting games like IDPA and USPSA because they offer everything necessary to play the game itself. Airgun sports like this are already popular in other countries with senselessly restrictive gun laws and I believe this is because of the romance of the firearm, the fundamentals of shooting and the fun of the game - not because they offer necessarily practical handgun training. So what about that practical handgun training. Well, ask all the professional instructors who use airguns what they think. My opinion and zen answer is, yes, but they are not a substitute. I think they are not a substitute for obvious reasons (plus the big three above), so lets move on. 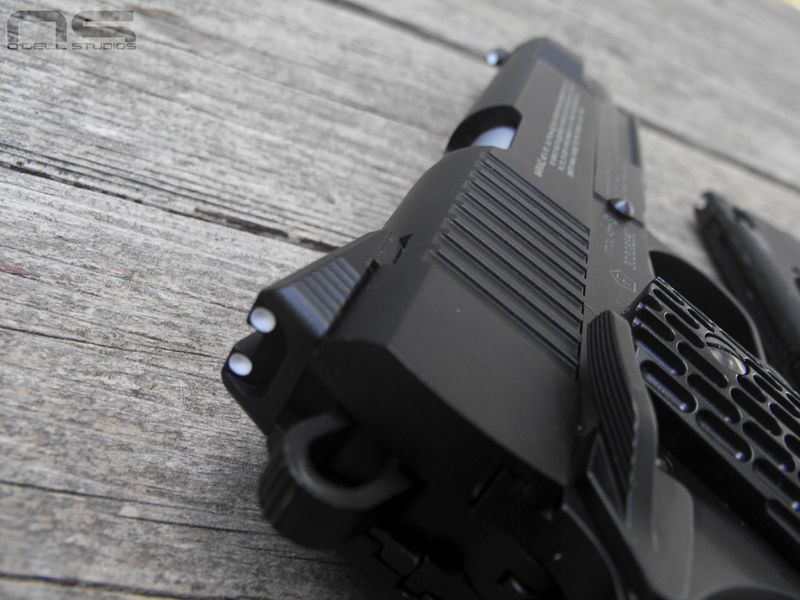 What is necessary for them to be used in a practical handgun training role? You're in luck, I have a list. But first let me say; I am not one of those professional trainers I mentioned a second ago. This post is not a teaching post, it is to open a discussion for what I believe is a market in its infancy in America and how I see the possibilities it offers. That said, these requirements are, I think, obvious. -I prefer steel BBs over airsoft - this is a significant limitation presently. With our requirements laid out let's get into some kind of detail. Reloads are a vital part of training and something that I see no reason airguns shouldn't replicate. If you look at the first image at the top you will see that a big part of the "NO" for the two guns on the left is their unique magazine dimensions. Second is complete departure on all of the controls on the PX4 Storm (far left). It has a bizarre proprietary safety located of all places, on the right side of the gun while the proper safeties are merely cosmetic. The magazine once again ruins the 1911 in the center (G&G Extreme 45) as well as very poor construction and design, and a departure in external dimensions and design from the 1911 platform. All of these guns have some sort of blowback feature but neither of the two guns on the left have a last round hold open feature. The trigger on the 1911 in the center is awful while the PX4 is actually useful for typical double action pistols found widely today. 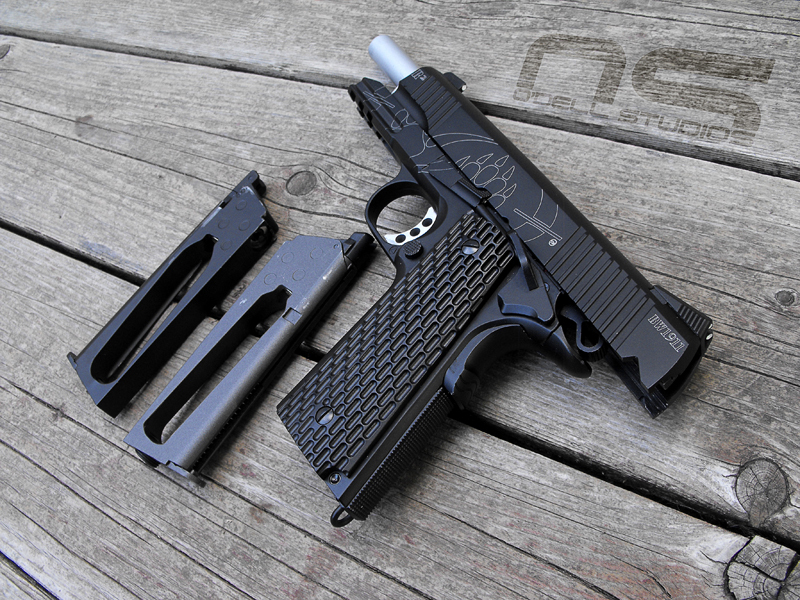 The G&G 1911 is airsoft. It will shoot some of the heaviest BBs available but wind is still a big factor where I live. Steel BBs, while not necessarily heavier than some of the heavier airsoft projectiles, are smaller and that suggests to me that they are also more dense. They deal with wind much more effectively and seem to offer a more stable trajectory overall. So while these guns are fun to shoot for shooting's sake, they don't offer much more than the fundamentals of shooting. As you can see from the other images there are significant differences from the gun pictured in the background when compared to an actual 1911 or the replica in the foreground. The grip angle is even altered. It is poorly constructed, has an oddly designed magazine that actually changes reload technique too much to be useful. It is also much wider than the firearm equivalent. 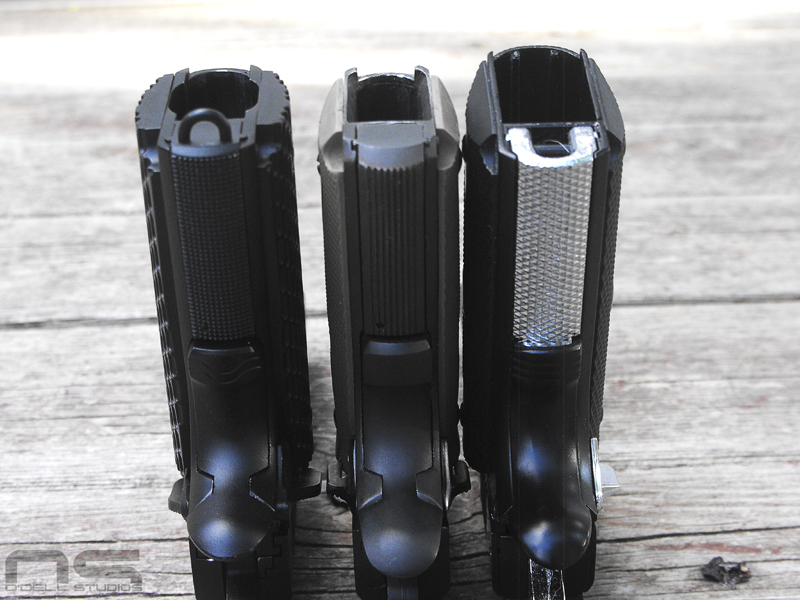 The actual 1911 (center) is about 1 1/4 inches at the grip and of course this depends on the grip panels you have installed. It is also about 3/4 inches wide at the frame. 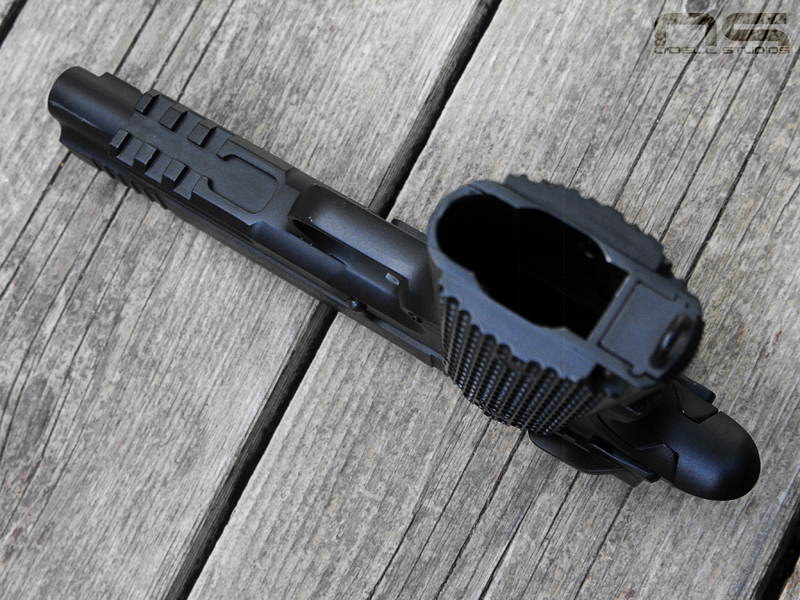 The G&G is 1 3/8 at the grip and 15/16 inches at the frame. It is wider because the frame is wider, not because the grip panels are. Obviously this brings up holster issues. However, it's important to note that the width of a CO2 cartridge is the deciding factor. 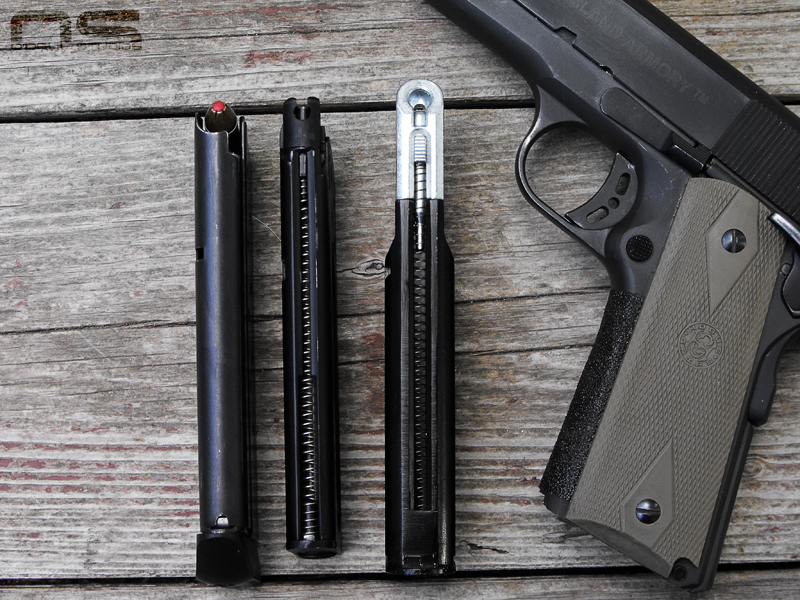 A CO2 cartridge is wider than a 1911 magazine. You can see how the gun in the foreground has overcome this issue though. 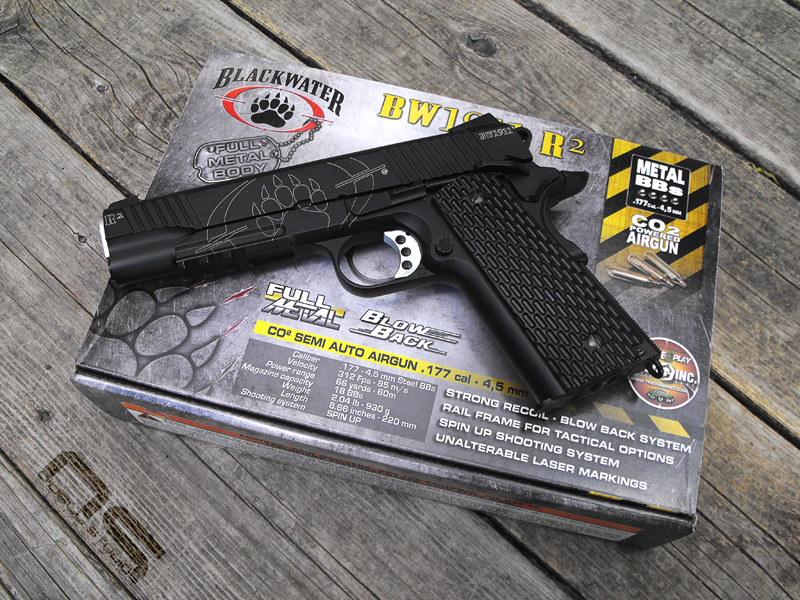 So with that, let's talk about the Cybergun BlackWater 1911 B2 CO2 steel BB gun .... or whatever they call it. There are several versions of this gun out there but this one with the somewhat silly logos was actually less than the all black version at $120 and you can score extra mags for $30. It checks most of the boxes in my requirement list. 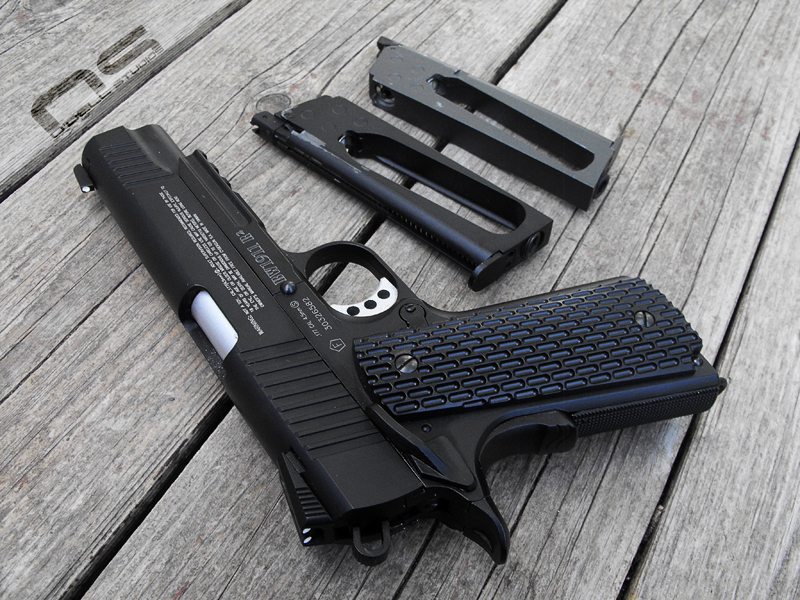 It feels like a 1911, same controls, last round hold open, magazines that feel and insert like the real thing, blowback, better construction than previous experiences, and a trigger that is remarkably similar to my Rock Island. The sights are also similar. 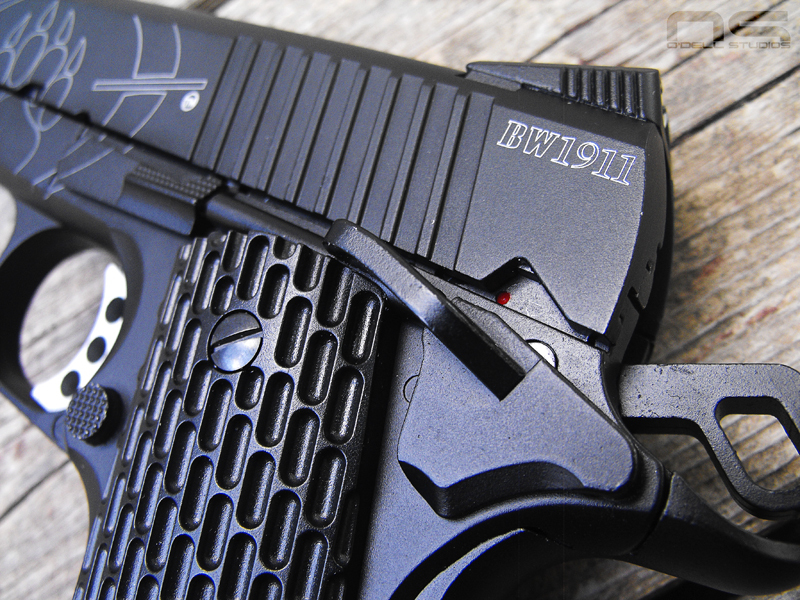 1911s offer the most difficulty because of the variety of safety switch design, sights, etc. There really isn't much that can be done about that. Guns like Glocks or M&Ps wouldn't have as many issues, though of course there are aftermarket parts available for just about every popular pistol made today. However, if anyone of consequence is reading, it might be genius to design some sort of standardized sight attachment system for every gun produced, then offer a variety of sights that would then attach to every gun in your lineup. Lockback works reliably so far. Note the magazine color differences. I believe the black one is painted special for this gun. The odd part is that it appears to be black over grey which adds enough thickness that it doesn't drop free. First order of business is to sand the mag down and get it nice and smooth. 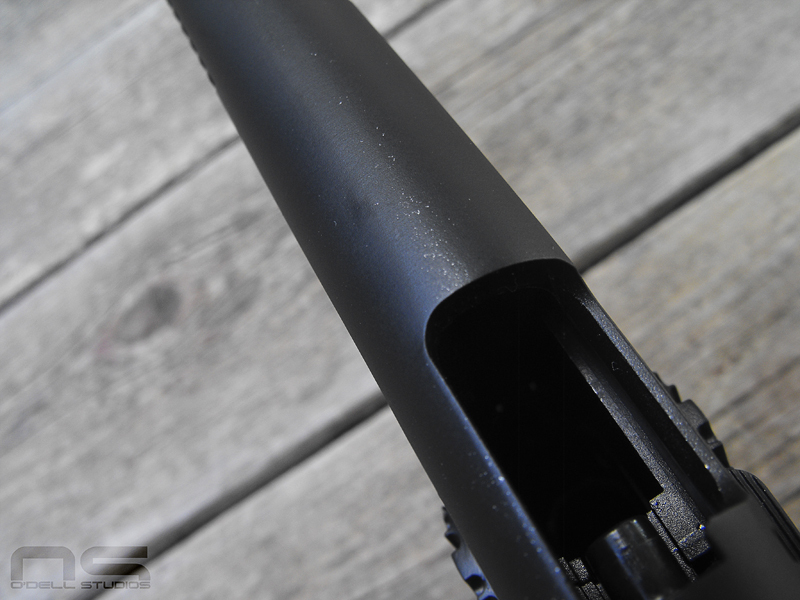 A typical little detail found on airguns - the red dot. Annoying crap printed on the side, nothing a good stripping and fresh paint can't fix one day. Something to talk about with the mags; will they survival falls? You know they are made of crap metal most likely and the little lip which acts as a floor plate for the BB tube will probably snap right off. I am going to try to rig some pads on the bottom - I just need to be able to fit an Allen wrench in to tighten the CO2. 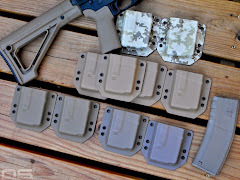 Should be easy enough and help protect the mags from falls. One, I think the mags should be designed with this problem in mind, with rubber pads built in. In fact, I would try to mimic 10 rounders. Second, I still don't think they will survive falls to concrete. Only time will tell. It's not a bad looking piece but all the bright finished parts are painted and somewhat poorly. 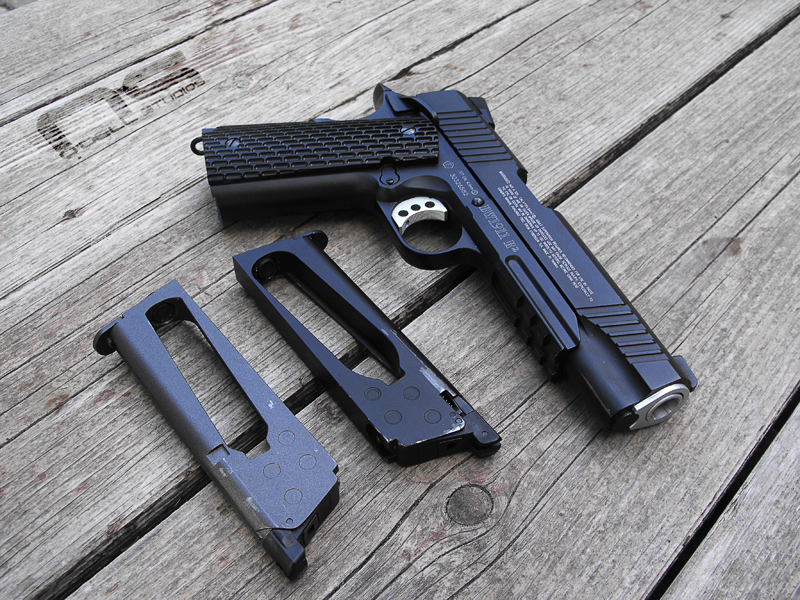 The grip panels are thick and the magwell has a bulge to accommodate the CO2, so actual 1911 grips won't fit without modification - modification that I don't think would be too challenging. 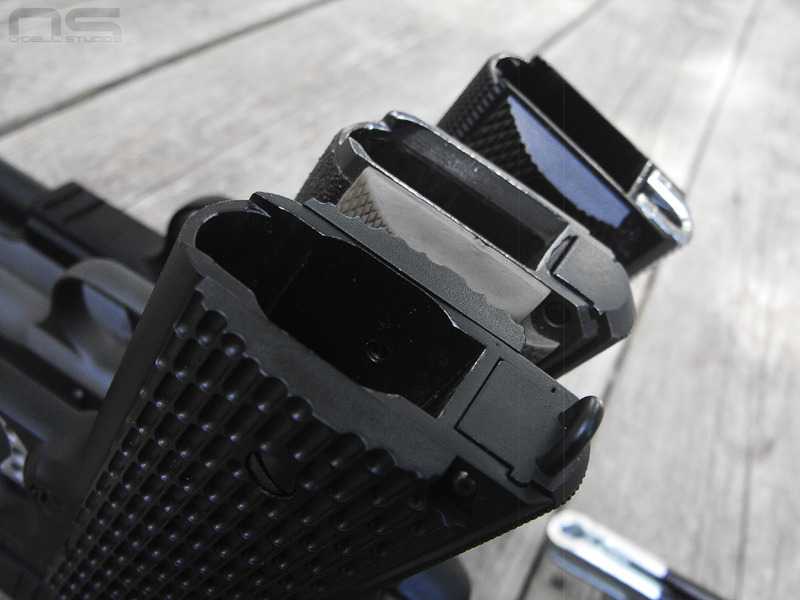 The screws are in the correct location, however, they do not thread into removable bushings the way an actual 1911 would, the grip screw "bushings" are molded in. This means thinner grips might not fly, although the craftiest modder might be able to make it work. You can clearly see wear marks on the black magazine. I am confident that stripping the paint will allow magazine free fall. The safety is pretty weak but workable. The trigger is a little mushy and has a little extra take-up but not awful and close enough to the real thing to surprise me. You can see how the CO2 fits without enlarging the frame dimensions. Smart thinking. The frame width is not exact however. It is a big 64th wider (or so) than the real thing overall. It's hard to say what issues this will cause with holsters. 1911 accessory rail dimensions vary anyway, but I suspect there will be one holster issue or another, if none other than simply being tight. I am used to black sights but these are workable and easily blackened. The gun is very accurate in any case. There are some goofy issues like the sight gap seen here. No big deal. Poor finish coverage seen here. It is obviously some kind of sprayed on paint and probably done in a single coat. I smell a project in my future. Bottom line here? 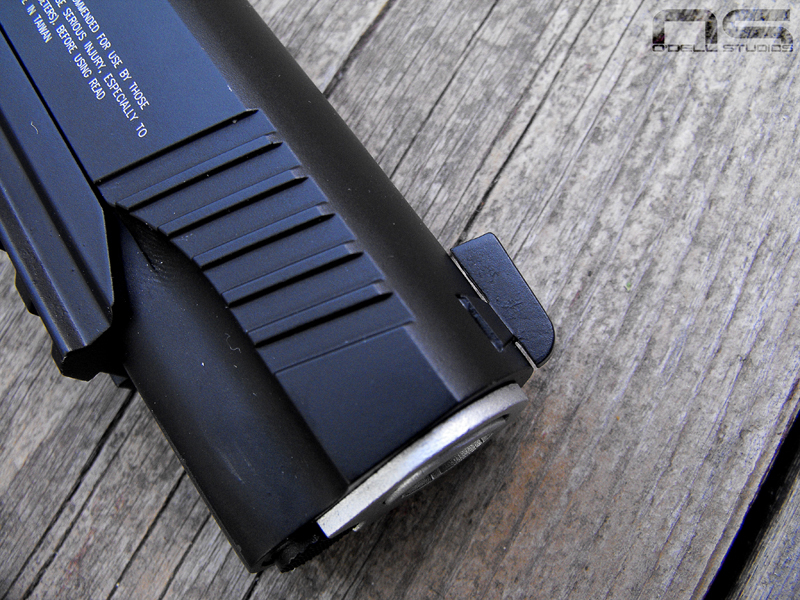 This gun has the potential to be at the front of a new market for airguns. I have been keeping an eye out and there are 3 or 4 guns like this one with more on the horizon. Are airguns finally going the right direction to gain some traction in a market where ammunition is either too costly or simply difficult to find? I think yes. If you want to talk money, you can't beat this type of gun and I think that people would be willing to spend another $50-100 on a product that will really hold up to significant use. 15 CO2 cartridges ran me $9 so that makes them $0.60 a piece. BBs, well I don't remember what I paid for them but you can get like 6,000 of them for $10 anywhere. Uh, the math here is rough but you have to pull the trigger about 5 times just to get to a single penny. And it doesn't hurt to have some kind of oil so let's just add another penny just for fun. You will easily get 40 shots out of the CO2, and probably more like 60. Again, for fun, let's go with 40. Let's be generous and say 40 rounds costs you $.80. That means every shot costs you about two pennies from a gun that costs half the typical .22 and a quarter of most common caliber defensive pistols. If we convert that into a box of ammo, 9mm runs about $10-15 for 50 rounds of the cheap stuff while 50 rounds for your CO2 pistol is a whole dollar. So it's cheap, and it easily fulfills the recreational shooting half of the equation. What is the next step? We've got a handful of attractive airguns that offer a lot for very little money but this one isn't perfect, and I suspect the others aren't either. The next step is for the people making them to realize the new group of buyers interested in something like this. They are going to be people who want more action in their recreational shooting. They are competitors. And they are tactical shooters getting additional trigger time. These people all overlap but unless the gun offers enough features that it's useful for all of them, then it probably won't be interesting to any of them. 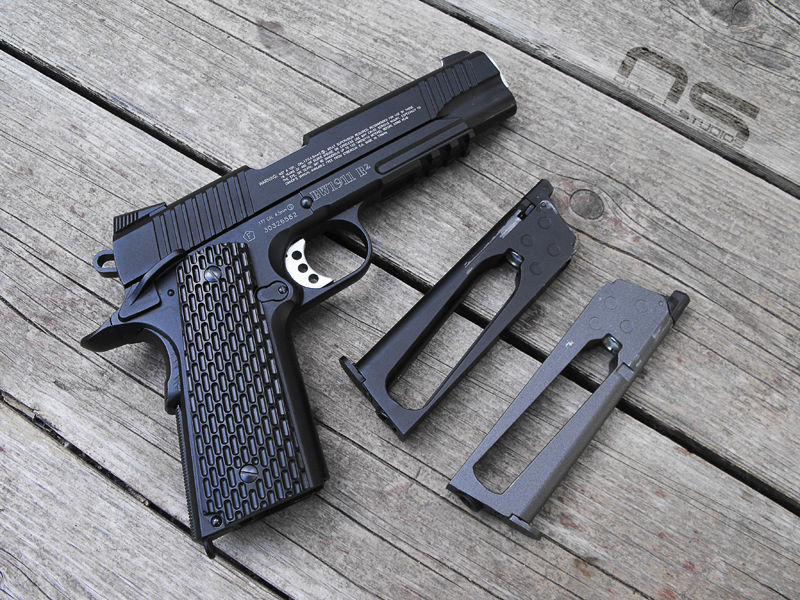 That means, if you make a 1911, it has to have magazine base pads. That's just a given today. In fact, all of the magazines are going to have to be designed to take a fall regardless of the gun. The aspects of the gun that interface with the hand have to be accurate to the firearm counterpart, however the rest of the gun should be made to be a good airgun. Replica on the outside, airgun on the inside. Make guns people actually want. This might be obvious but I look at the airguns, especially the steel BB versions, and wonder why in the world they choose that model. Airsoft has it covered but I think the plastic BBs and "green gas" have certain disadvantages for this specific market. The people making them are going to have to get into the Glocks, M&Ps, XDs, and so on. The only way they are going to get traction is by replicating guns people compete with, guns cops carry, guns people enjoy shooting - modern pistols. And lastly, create some kind of standards. The guts should probably all be the same and be built in such a way that they can be repaired, modified or enhanced. This kind of thing creates an aftermarket and the aftermarket can build momentum for popularity. 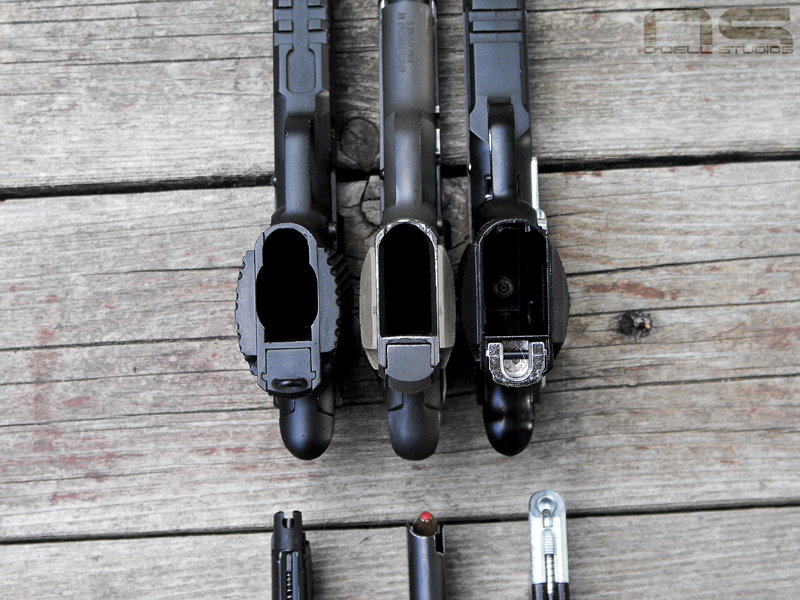 Don't get hung up on replicating every aspect of the firearm equivalent. The parts that interface with the hand are vital, the rest is free game as far as I'm concerned. Do something that allows people to customize and tweak, and do it in their living room. And that's it for Part 1 - another epic post. Part 2 is just going to really be my thoughts on the subject after I've had time to really shoot the gun. The other two guns I've had for a couple years now and they just didn't do it for me. I am hopeful that this gun has enough of the right stuff to start a trend toward accurate replica CO2 powered steel BB airguns for the shooting sports community.